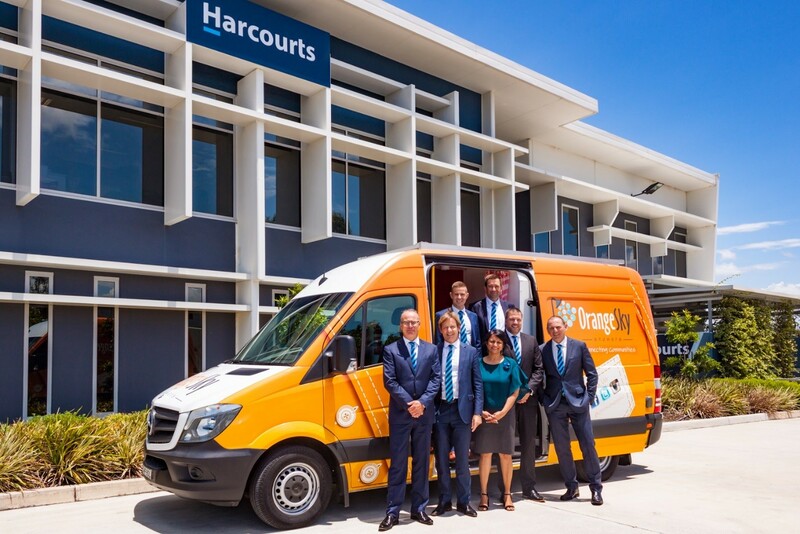 The Harcourts Foundation, the charitable arm of Harcourts Group Australia, announced a new initiative to designate Orange Sky Laundry as a preferred national charity. Orange Sky Australia is the world’s first free mobile laundry and shower service. Co-founders, Nicolas Marchesi and Lucas Patchett, were named 2016 Young Australians of the Year for their work in establishing the organisation. “We were first introduced to the inspired work that Orange Sky Laundry is doing while at our annual Conference in May 2017,” said Marcus Williams, Harcourts Group Australia CEO. “Over 500 Harcourts team members heard about the direct impact in our community made by donations through The Harcourts Foundation. Mr Williams went on to explain that the first grant to Orange Sky Laundry was made through the Harcourts Western Australia office team who designated $6000, which is equal to providing 1000 washes. “Since Orange Sky kicked off in October 2014, we have been continually blown away by the support we’ve received and how well the vans have been integrated into a range of communities,” said Mr Marchesi. While Orange Sky is known for providing laundry and shower services, Lucas said it was the hours of conversation that has the biggest impact. “Our six orange chairs are the most important part of our service. It’s where our friends who attend our shifts have the opportunity to sit and build relationships with volunteers through genuine and non-judgmental conversations,’’ he said. Since the mobile laundry van began offering free laundry services in Perth North in July 2017, Orange Sky has undertaken over 5,000 washes and generated over 6,800 hours of genuine and positive conversation with our homeless friends. These funds, raised by Harcourts Kalamunda at their fundraising Dinner Dance in October 2017, will contribute to the ongoing operation of the laundry van, specifically covering costs associated with volunteer recruitment and training including specialised First Aid Mental Health training for new and existing volunteers. Harcourts corporate team members who salary sacrifice to the Foundation are given the chance to nominate a specific charity for a grant as part of an initiative called ‘corporate choice grants’, while the Landmark Harcourts network also designates grant recipients. These contributions now proudly support Orange Sky Laundry Australia. Since The Harcourts Foundation’s first donation in 2008, over $5 million has been raised. That translates to 686 charities supported, 311 communities impacted, and 851 grants made through Harcourts offices in New Zealand, Australia, South Africa and the USA. © 2019 Copyright Harcourts Foundation. All Rights Reserved. This website is best viewed with IE 9 or above; Firefox; Safari or Chrome. Information for Harcourts Reports is sourced from Harcourts International Ltd. Harcourts International Ltd gathers information publicly available from sources such as REINZ, REIQ, REIWA, REINSW, REISA and Harcourts own sales database. In designing this web site, we have incorporated security procedures and practices that we consider are consistent with best industry practice. We review our security procedures from time to time and update them when relevant. Protecting your information is important. If you submit information to Harcourts either by using an electronic form or by sending an email we collect that information and use it for the purposes for which you have provided it. In addition, we may use your information to provide you with special offers, information about new products and special promotions that we think may interest you. If you do not want to receive this information, you can let us know by sending an email to privacy@harcourts.net, by mail P.O Box 8054, Riccarton, Christchurch, New Zealand or call +64 3 348 8784. Please provide us with your customer details including name, address and contact number. In addition, indicate if you do not wish to receive any more promotional material. Personal information about you and your business with Harcourts is only accessible by you and by Harcourts personnel who also must use a password, and are bound to safeguard the information and access it only for approved business purposes. Every precaution has been taken to establish the accuracy of the material herein. Prospective purchasers should not confine themselves to the contents but should make their own enquiries to satisfy themselves in all respects. Harcourts International Ltd will not accept any responsibility should any details prove to be incomplete or incorrect. All references to "agents" are strictly for ease of clarification and that they are all officially "sales consultants". Design and contents are Copyright Harcourts International Ltd.
No reproduction, distribution, or transmission of the copyrighted materials at this site is permitted without the written permission of Harcourts International Ltd, unless otherwise specified. We have been made aware of people, via facebook messenger, impersonating The Harcourts Foundation, friends or relatives, or other public figures, to solicit people to apply for a “grant” through the payment of an “application fee”. Please note: the ONLY way to apply for a grant is through our website and we will NEVER ask for an application fee or any kind of payment to apply for a grant. Please forward any suspicious communications to the ACCC’s Scam Watch and to information@harcourtsfoundation.org. If you or someone you know has transferred funds to any parties falsely representing The Harcourts Foundation, please contact your local police.